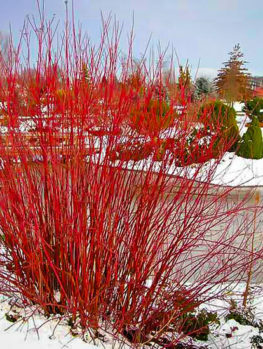 The Red Twig Dogwood is a medium-sized shrub outstanding for its brilliant red stems that bring rich color to the garden in winter. It is especially useful in colder areas, since it is hardy to zone 3, as well as for growing in wet locations, where it will grow very well. 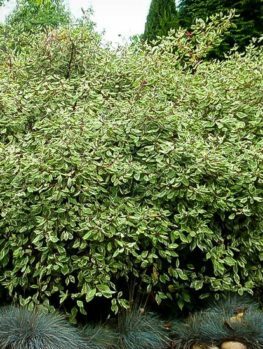 This deciduous shrub has rich dark-red leaves in fall and attractive green leaves all summer. 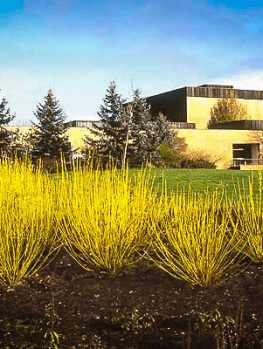 Anywhere the brightness of its winter twigs can be appreciated is a great location for this hardy, easily-grown plant that will fit into any garden right across the country. This is an excellent choice for foundation plantings, informal low hedges, natural and wild gardens, water gardens and ponds. It grows quickly and it can be pruned or left to grow naturally, depending on the appearance needed. The Red Twig Dogwood is an attractive shrub growing 3 to 12 feet tall, depending on the location and the amount of pruning done. It will grow well in sun or partial shade and is especially suitable for damp or wet locations where many other plants will not grow. It is grown mainly for the beautiful rich red color of the bare twigs in winter, which look especially beautiful against a snowy background or on a sunny winter’s day. It is an excellent choice for a bed of mixed shrubs, as a foundation planting or in all parts of the garden. This plant also makes an attractive informal low screen or hedge and it is a good way to mark a property boundary. It is especially useful around water in formal or natural settings. 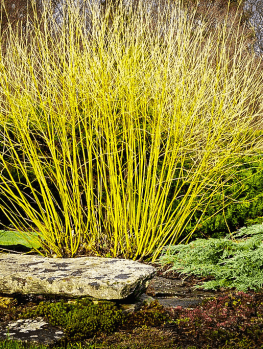 For a very attractive planting, mix the Red Twig Dogwood with the similar Yellow Twig Dogwood to create a stunning color combination of red and yellow twigs that will give a lift to the gloomiest day in winter. In fall the leaves turn deep red, making a lovely addition to the fall display and adding to the value of this easily grown plant. 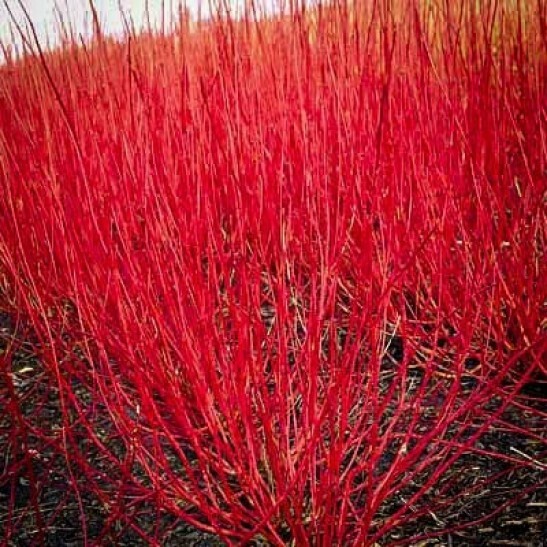 The Red Twig Dogwood grows into a shrub 12 feet tall and as much across, however it is rarely seen that large but more usually 3 to 5 feet tall. It remains twiggy right to the ground and rarely develops large stems; instead new shoots come from around the base of the plant, spreading into a thick clump. It has oval leaves that are usually about 2 inches long but can be up to 4 inches long. The leaves turn rich shades of deep red in fall, making the plant an attractive addition to the fall display of colors. However, it is in winter that this plant really makes an impact; when the leaves fall the red twigs are revealed, making a spectacular display throughout the dormant season. Flowers are sometimes produced. They are small and white, in clusters 2 to 3 inches across. White berries are produced which can in some years make an attractive display on older plants. 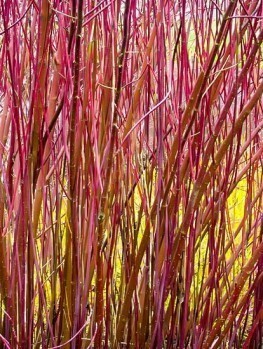 The Red Twig Dogwood will grow well in almost any kind of soil, but will grow especially well in wet and even boggy soils. It is hardy all the way into zone 3 and it will also grow in zone 8, so in almost all but the very warmest parts of the country this beautiful plants can grow and bring color to the gloomiest winter’s day. If you have wet areas in your garden, this plant is an excellent choice, since so many other plants need the usual ‘well-drained soil’. In fact the best growth and color is found on plants in wet soil. It will grow in full-sun or partial shade equally well and once established it will even withstand periods of moderate drought. 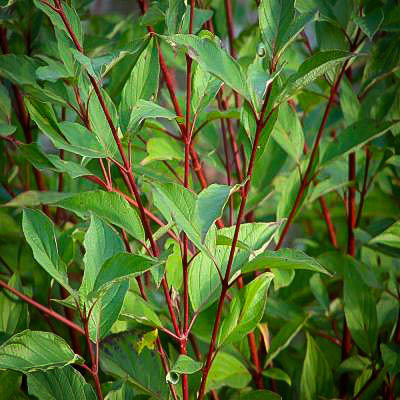 To plant your Red Twig Dogwood, choose a suitable location and dig a hole that is three times the width of the pot and just a little deeper. When planting a group, a row or a screen, space the plants 4 feet apart. Mix some organic material into the soil and plant your shrub an inch or so deeper than it was in the pot. Replace most of the soil, press it down around the roots with your foot and then fill the hole with water. When that water has drained away replace the rest of the soil. Keep your new plant well-watered during the first year and after that do not let the soil become completely dry for very long. 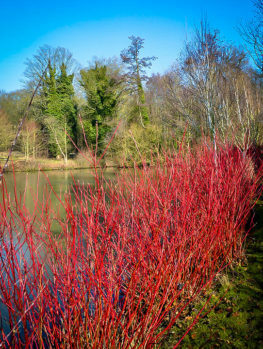 Although the plants can be left un-pruned, to get the most colorful twigs and to control the size it is usual to prune the Red Twig Dogwood regularly. There are two methods used. Each spring remove about 25% of the branches at ground level, to encourage new, more brightly colored shoots. Alternatively, you can choose to cut the whole plant back to a few inches tall every second or third year. Only use this method with strongly-growing plants or the plants will weaken over the years. This method does give the best twig display. Plants that are regularly pruned flower less, but the flowers are not an important feature of this plant. Native Plants don’t always come very high on the list of plants grown in gardens. Exotic imports are often more popular, because of their novelty or often because they are easier to grow. 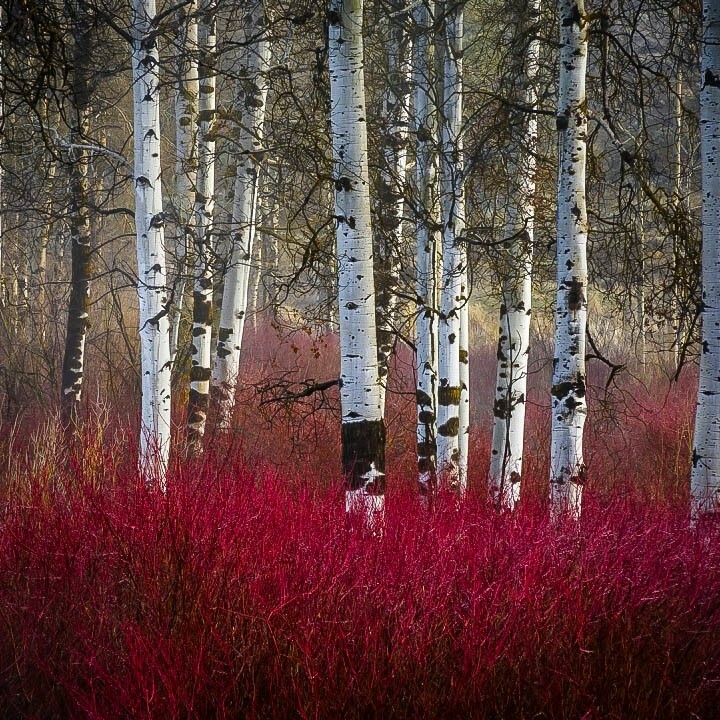 So some gardeners may be surprised to discover that the Red Twig Dogwood (Cornus sericea) is native to a large part of North America, from Alaska to Newfoundland, south into Colorado and east to Virginia. In older books it is often called Cornus stolonifera. In the wild it grows in thickets in wetlands and can reach 12 feet in height. Native Americans used the berries as medicine and smoked the inner bark, alone or mixed with tobacco and other plants. 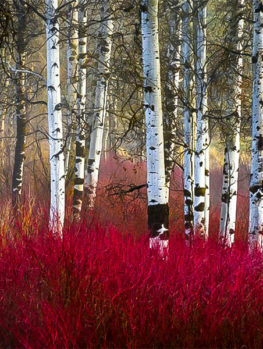 Red Twig Dogwoods can vary in the richness of their twig-color, so it is important to grow new plants from ones with the best color. Our plants are grown from stem cuttings of the best plants, so avoid cheaper seedling plants that will not show the rich colors that make this plant so valuable in the garden. 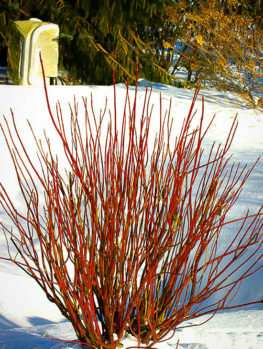 The Red Twig Dogwood is a very popular plant and a favorite with smart gardeners. Although we receive regular shipments to send our customers the best quality possible, sometimes shortages can occur, so it is best to order now. 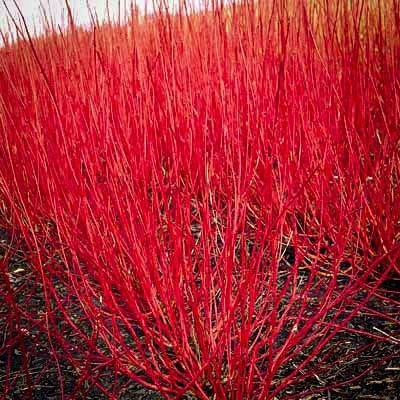 We invite you to also check out similar varieties that we carry, like the Cardinal Red Twig Dogwood and the Arctic Red Twig Dogwood.